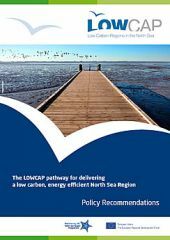 The LOWCAP cluster brought together the results of existing North Sea Region Programme projects together with non-partner projects, which shared carbon reduction and energy efficiency as themes. The cluster project enhanced and extended the outputs of these results through the identification of synergies and ‘high impact’ projects, which offered the potential to be transferred. By creating a 'programme perspective' on key aspects carbon reduction and energy efficiency, LOWCAP demonstrated where tangible progress had been made and where it had proved difficult to progress. The EU2020 targets identify three main areas of activity: a 20% reduction in greenhouse gas emissions, increase in 20% of energy from renewables and 20% increase in energy efficiency. Translating EU wide targets into practical initiatives which deliver real change is a major challenge for policy makers. Delivering carbon reduction requires a balance between what is technically possible and what is politically, socially and economically feasible.